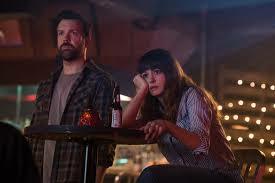 In Colossal, the new Sci-Fi, rom com hybrid, Anne Hathaway plays Gloria, an alcoholic unemployed journalist who gets thrown out of her boyfriend’s apartment after one drinking binge too many. She returns to her home town where she runs into Oscar (Jason Sudeikis), an old friend she knew as far back as elementary school and only vaguely remembers. He gives her a job at his bar and the next thing you know, a Godzilla like monster is making occasional appearances in Seoul, Korea. And the next thing you know after that, is that Gloria is somehow responsible. Colossal is proof that you can have the most ridiculous, absurd and unbelievable events happen in a movie if the characters react to them in a logical and believable way. And, boy, do the most ridiculous, absurd and unbelievable events happen in this film. 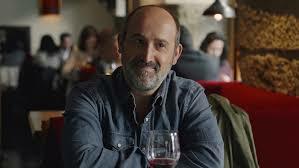 The man responsible for the piece of preposterousness is the Spanish writer/director Nacho Viglando whose first feature, Timecrimes, is a fascinating and riveting riff on time travel movies, and whose second, the underrated Extraterrestrial, was another hybrid, but this go round, Sci-Fi and farce. 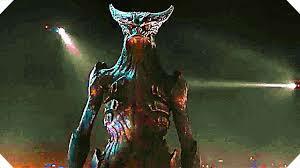 And Colossal is a simple delight. No matter what else it is, it is highly entertaining and a real crowd pleaser (and I’m not using the term negatively here). It’s often a marvel and a joy to watch. I can’t imagine many people disliking it. It does have one issue. At one point it takes a very dark turn as a character is revealed to really be other than what he originally was. This threw the movie off for me a bit and I think the reason is because the metaphor, which was a little unclear at first, though it didn’t matter because the movie was so much fun, is now really muddled so that when it’s all over, it’s a little unclear just what the whole point was. At the same time, I still felt very satisfied once the final credits ran. Hathaway and Sudeikis acquit themselves quite well. And they have an able supporting cast with Tim Blake Nelson (O Brother, Where Art Thou) and Austen Stowell (Gary Powers in Bridge of Spies) as drinking buddies and Dan Stevens, who seems to perhaps have made the right career choice in bowing out of Downton Abbey, as Gloria’s boyfriend. 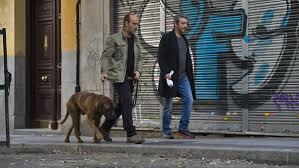 Julian (Ricardo Darin) and Tomas (Javier Camera) are best friends. But some time ago, Tomas moved to Canada with his family and stayed, building up a comfortable middle class existence. Julian, meanwhile, continued to rise as a sought for actor. Tomas has now come to Madrid to see his old friend, but not simply to play catch up. He’s come to basically say goodbye because Julian has cancer, and no matter what the doctors can do, it is only a matter of time. There’s really very little to say about Truman. It’s a lovely and powerful film with almost no fireworks and all the better for it. Nobody hates anybody; there are no old wounds that need to be healed; no outstanding issues that require resolving; the arias are not operatic; and the conflict is definitely more Chekovian than Shakesperian. In many ways, the two spend their time doing things they would do even if Julian was not terminally ill. With a running joke of Tomas paying for everything. The most pressing need for Julian is to find someone to take his dog, the titular Truman. And the suspense there is at times quite palpable. 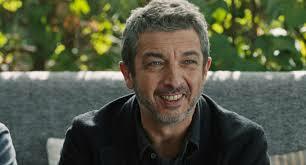 Darin is one of Argentine’s finest actors having gained notice in the U.S. in such films as The Secret in Their Eyes, Carancho and Wild Tales. He plays Julian with great empathy and an overpowering quiet dignity. He gets solid support from Camera, playing a likeable, down to earth man with a sweet nature. The two feel as comfortable in their roles as best friends as if they were putting on old sweaters from their college days that still fit. The screenplay is by Tomas Aragay and the director Cesc Gay. I first noticed them in their coming of gay age film Nico & Dani, also about two friends, one straight, one not, getting together after a separation, but at a much younger age. The filmmakers seem to have a knack for it.